Bone broth reigns supreme at the Emeryville restaurant. Steven Yamaji hails from Japan and has lived in the Bay Area for 26 years, and says he and his business partner want to bring healthy Japanese food to the Bay Area. “We tried ramen everywhere,” Yamaji told the Express. They ultimately decided to open a ramen restaurant after what they described as being dissatisfied with the way other broths left them feeling heavy, or unwell, after eating a bowl of noodles. The restaurant opened last September and has since built a solid following. The ambience is homey and comfortable. Inside, seating includes a bar and tables, and there is a nice outdoor patio that seats up to forty people. The broth is key to the restaurant’s success. There are four types: pork, miso, beef, and vegetarian. There are also spicy versions of each noodle soup. The meat broth bases are made from grass-fed beef bones and pasture-raised pork bones. “We have access to extremely high quality beef and pork bones here,” Yamaji explained. They also offer four types of cold ramen dishes. The bowls run $14-17. 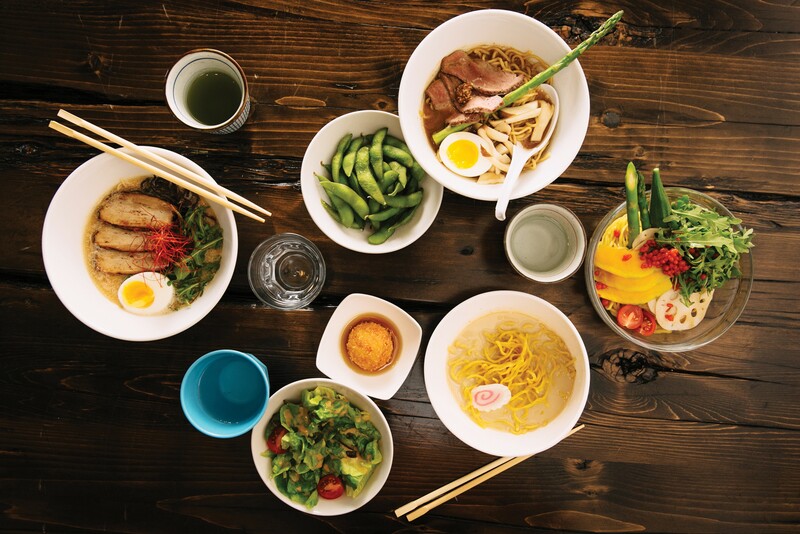 Each dish comes with a choice of noodles: Nagahama-style, which are thin and straight, originating from the birthplace of tonkotsu ramen in Japan; slightly wavy ramen noodles; or udon. I tried a variety of combinations, and have to say that you can’t go wrong with any choice. Gluten-free noodles are also available for an extra $1. The tonkotsu pork broth ramen is the most traditional. “It’s as authentic as it can be, as far as the tonkotsu broth itself,” Yamaji said. It’s rich but not heavy, and the slices of pork are charred just right to infuse a smoky flavor. It comes with half an unmarinated soft-boiled egg. The spicy version comes with pretty, thinly shredded red chili pepper. They also offer a beef bone broth ramen, which is less common. The beef is tender, pink in the middle, and left to cook longer in the hot broth. This unique dish reminded me slightly of Taiwanese beef-noodle soup, and those who enjoy that dish may appreciate this one, too. The fried chicken appetizer, which comes with four crispy wings sprinkled with sea salt, were a hit at our table of three adults and two kids. The dish comes with three dipping sauces: chili yuzu, spicy mayo, and matcha salt. The fried gobo sticks appetizer came as thin slices of deep fried gobo root. These would be more palatable with less salt, but are a fun food to munch on as an appetizer, for small kids or as a bar snack. It’s noteworthy that the restaurant has one of the East Bay’s best kids’ meal deals: for $5, you receive a bowl of tonkotsu ramen, noodles about half the portion of an adult bowl and broth that has less sodium than the adult version; a green salad; an organic juice; and a dessert, which is currently a malted milk rice fritter, lightly fried, sticky, sweet, and wonderful. Yamaji understands that its hard to eat out with kids, who often don't have options. “We want families to come out and enjoy dining with us.” On the two times I visited, there were plenty of children and families. Unconventional ramen toppings, including squash and cherry tomatoes. Now, about the second part of the restaurant’s namesake: broffee, which rhymes with “coffee” and is a word that the owners came up with. Many cultures consume bone broth as a healthy food, often when one is sick, pregnant, or after giving birth. However, it’s considered a healing soup that one can drink anytime. A 12-ounce soup-in-a-cup order, which comes in a coffee cup, is $4-$5 (pork or beef bone broth, respectively), and you sip it as you would coffee. You can also order broth to take come in a larger glass jar for $8-$10. The broffee broth is based on the same base broth as the pork and beef broths, but lighter and with less salt and seasoning. The only disappointing dish was the vegetarian ramen, which is based on a vegan broth made from organic vegetables. The broth seems to be soy milk-based, which tends to curdle and dry up with heat. The noodles soaked up much of the broth, which became thicker over time, and overall the dish lacked flavor. 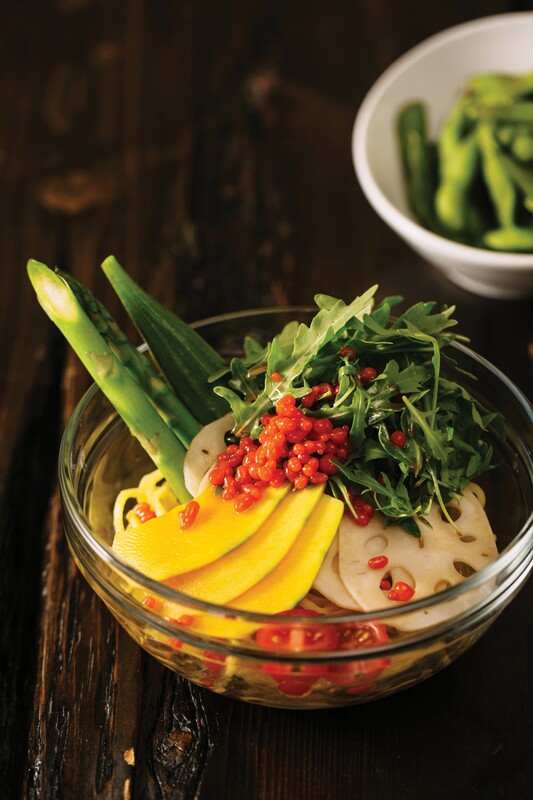 In contrast, the toppings were fresh and light, including crunchy kabocha squash, cherry tomatoes, fresh arugula, asparagus, okra, and sliced lotus root — all of which would be good on a salad, but didn’t make as much sense in a hot noodle soup. However, I should note that I was delighted to see them use lotus root, an unabashedly Asian ingredient, which in my humble opinion is underutilized in American cooking. The same vegetables come with the veggie cold ramen, which comes with a more flavorful sauce and works better in a cold noodle dish. The portion size for each bowl is just right, but save room for dessert — they currently have three: malted milk rice fritters, a spring fling coconut dish, and matcha crème brulee. The latter is thick and creamy, with only a light layer of carmelized sugar, and mild matcha flavor. The fried sweet rice balls were a hit with the kids at our table.